The sound hypotheses: Charlotte Charbonnel reaffirms our understanding of sound, addressing elements from near and far, from high in the sky to far below ground… At times working on a sound landscape of the everyday life, she chooses to isolate certain sounds in order to better reveal them to us, to simply make us hear them. Sounder cartographer, the artiste auscultates diverse spaces. The sound excerpts are amplified. Their diffusion is often direct, randomly/unpredictably avoiding the end point to not close where it all begins. Such an alchemist, she gives the sounds their own existence, a dignity, a preciosity absent here??. The metamorphosis operates by the circulation in diverse receptacles. Her explorations drive her to create installations or sculptures combining at once sound, materials, and movement. The materials and the forms retained? hold an important role in the sensory experimentation. These components can be manipulated, unveiled, or proliferated, thus catching our attention. Our points of reference are disturbed while simultaneously provoking a favorable state at the poetic experience. The listening, the manipulation, the wandering become a means of understanding, an informed awareness. 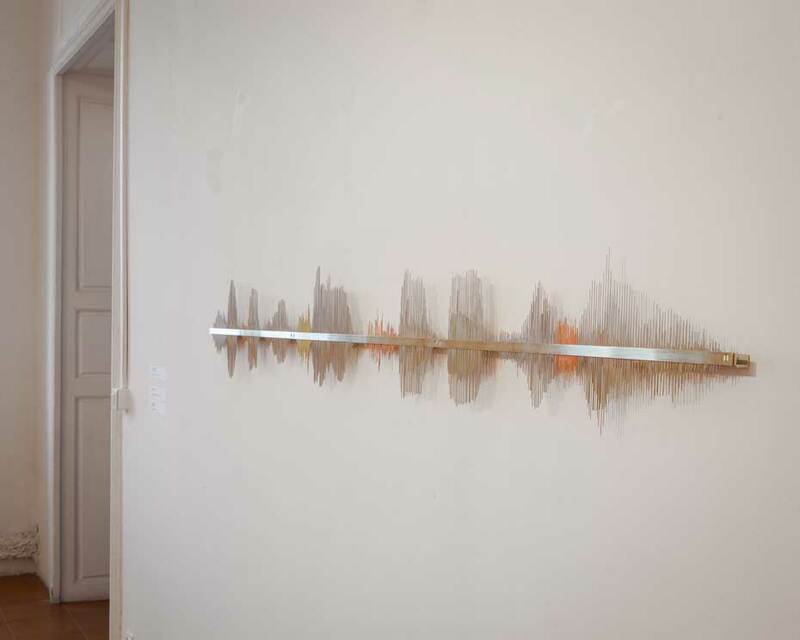 Charlotte Charbonnel’s exploration of the emergence of certain imperceptible or unknown sounds drives her to spontaneously realize sound « typography », such as Sons inconnus, Pantonnier sonore, or even Ce que le sonore fait au visuel, a work realized and presented at the eponym exhibition. These « typographies » visually highlight the appearance of sound, evidencing their originality?/depths?/relief?, their formation, their variations… With Ce que le sonore fait au visuel, the public is once again brought? to participate in the experience. In fact, the work two meters long evolves according to the displacement of the visitor. 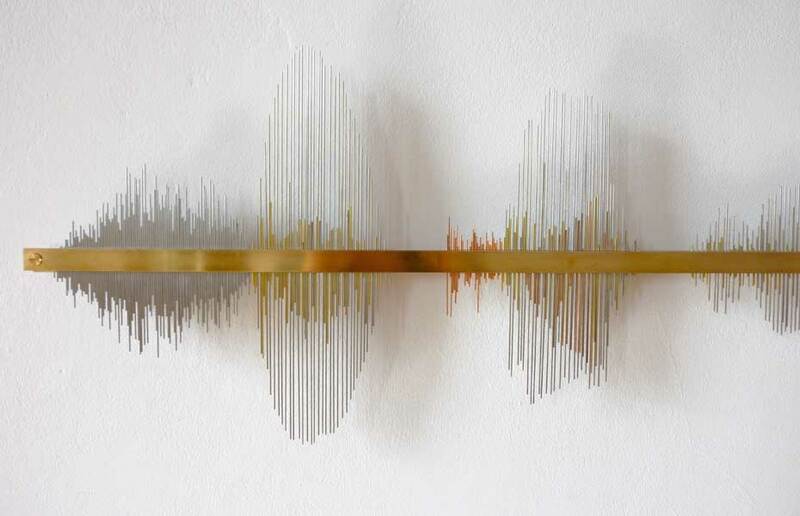 The light plays, slides, on the different materials (brass, stainless steel, nickel silver, and copper), revealing the gleam of the colors resembling sounds created by the voice. Because the precise starting point of this work synesthesia: experiences/experiments?, amongst others, where sounds are associated to colors. The artist reordered her own voice while saying the title of the exhibition. 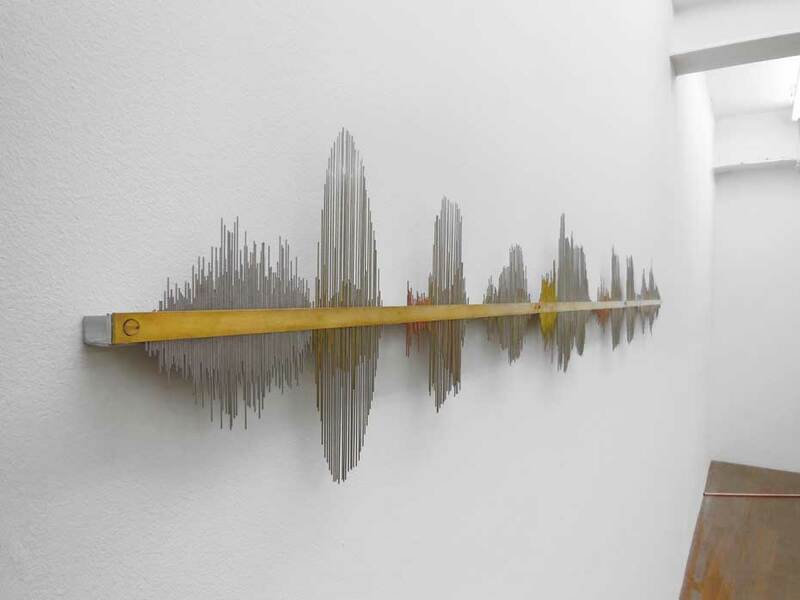 An ensuing graphic permits her to create the shape of the sound spectrum by volume. The mise en abyme, the change in scale, the destabilization suggest to us a new framing, a new perspective. While renewing our perception of reality and encouraging us to remain attentive, the acoustic and sensory experiences of Charlotte Charbonnel extricate a poetic force ideal for the imagination. Translated from Leïla Simon, 2014.